What does one do with a bunch (or 5) of bok and pak choi? Heat the vegetable oil in a wok then add chois, garlic, and ginger. Stir fry for a couple of minutes. 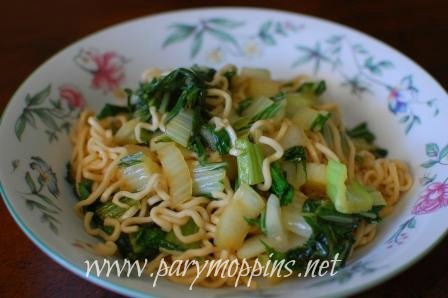 While the veggies are cooking, put noodles in a bowl. Pour over enough boiling water just to soften the noodles. 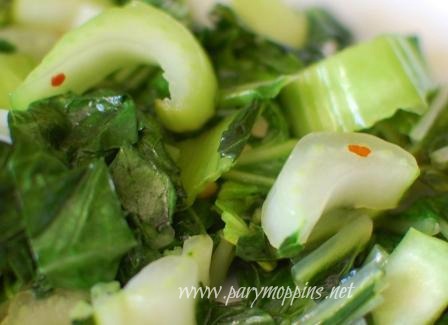 Once the veggies are bright green and almost cooked through, put in the seseme oil. Pour in the noodles with some of the water. Sprinkle the flavor packet (from the noodles) over the stir fry and pour in some soy sauce. Give everything one good stir before serving. Heat the oils in the pan. Stir fry the garlic, ginger, scallions, and chilies in the oils for about a minute. Throw in the chois and stir fry for a few minutes (until stems are crisp/tender.) Salt to taste. I don't know how people live without the Ramen Noodles, this looks so good. Hope you are having a great weekend and thank you so much for sharing with Full Plate Thursday. I know what you mean. I have several recipes that call for Ramen noodles.